American Pets Alive! | Meet the Next Top Model. And learn why dogs like her will one day be safe. We teach shelters how to provide lifesaving options for dogs like Jackie. GPG provides socialization and enrichment for all dogs in their care but, for some dogs, the stress of the shelter is still too much. 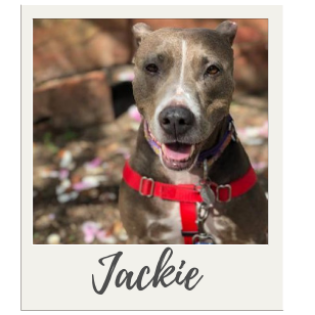 This was true for Jackie and, while she continued to be super friendly with people, she became more and more reactive to other dogs. Research has found that behavior we see in shelters doesn’t predict a dog’s behavior once they're in a home. Despite this, at shelters across the country, dogs like Jackie are placed on the euthanasia list. Luckily, that’s not how her story ends. Jill Henke, Program Manager at GPG, was selected to attend our Maddie’s® Canine Lifesaving Leadership Master Class to learn how she can help save more dogs at her shelter. We are experts in behavioral training and shelter processes that help long stay dogs find their forever homes. Now at GPG, dogs like Jackie, who are stressed in the shelter and need a lifeline, are given one. Jackie is now in a foster home awaiting adoption! Her foster takes advantage of all the support and training GPG offers and Jackie has adjusted well. In foster care she gets to be herself— a sweet, mellow dog who is ready for adoption. Find out more about Jackie, here. American Pets Alive!, the national program of Austin Pets Alive!, is working with hundreds of shelters to increase lifesaving across the country by implementing proven programs. We won’t stop until every pet is given a true chance at life. But we need your help to make this vision a reality. Donate today to support our lifesaving efforts and help more dogs like Jackie!